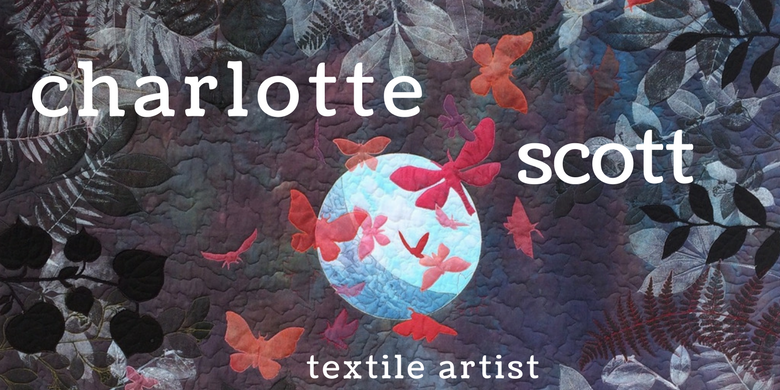 Charlotte Scott - Textile Artist: And, just like that, I'm a Art Gallery owner..
And, just like that, I'm a Art Gallery owner.. This has never, ever been in my plans, but it is now, and I'm super excited and really working hard to make it work. Here's a little background: My husband and I have been casually looking for a studio space 'off-boat' for me. I say casually, because this year was meant to be all about consolidation. We didn't want to spend any money and I was pretty happy making do with a corner of the saloon. 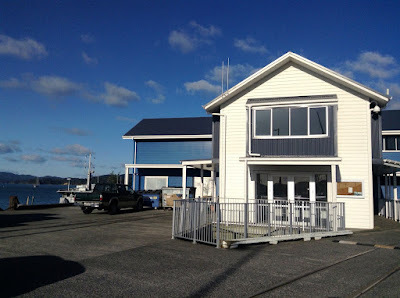 But I take up a fair amount of room, so we have had our eye on a beautiful office just across from us on the Opua Wharf. Problem is, it is a commercial space and the rent would be well unaffordable just for a studio. The fence in front of the building surrounds a hole in the wharf looking straight down to the water. About a week ago, my husband (bless his cotton socks), came up with a plan. Why don't I have a working studio, open to the public, with half the space as a gallery selling local artist's work? I can sell my work, my hand-dyed fabrics and possibly other small items like bags and table runners. I can sell other artist's work on commission, and there is room upstairs for myself and other artists to run classes and community arts groups. We envisage it becoming a thriving arts hub, supporting the local arts community and the community in general, and all the while providing me with a space to work and produce my own art. My proposal to the landlord (a council owned company heavily invested in the community) was accepted. Just like that I have the keys and I'm planning an opening night in two weeks. So I'm excited, yes, but I'm also just a teeny massive bit scared. All of the sudden there are a million things to do. I need to set up an accounting system, I need to make display plinths, I need to contact all the artists I know (and don't know), I need to make an inventory, I need to write gallery contracts, press releases and opening night invites. So 'scuse me if you don't see too much of me in the next couple of weeks. I'm busy learning how to run an art gallery. PS - If you are a Northland based artist reading this, please email me (you'll find my email address under my profile) with your portfolio and we can talk! How awesomely.adventurous! Do you have room for entire quilt retreats? Will you post pictures once it's together? Will we be able to order from the Internet??? Thanks Gretchen! No, there isn't room for people to stay, but there is room for classes of up to about 10, depending on what we are doing. I will definitely be posting pictures when it's up and running. At this stage I won't be doing an Internet based shop, but never say never! So excited for you! Wishing you the very best of luck in this, Charlotte! Fantastic! So glad for you--it'll be a lot of work but what a great addition to the community when you've got it up and running! This is such great news! I know it will be a lot of work getting set up, getting a business license etc, but you can do it. Ask for help!!! Will you still be doing midwifery? Will your quilt group be able to/willing to meet there? Will you have an online shop as well? Thanks Jaye, I'm asking for help left right and centre, and people are being very generous! I will still be doing midwifery, my small stitching group will be able to come visit every now and then and I'm hoping to encourage some more local groups. No plans for an online shop just yet. Congratulations. I thought I had read the title wrong! This is an exciting venture Charlotte and I wish you every success and hope the community gets behind the initiative. Midwifery? Thanks Marlene! Yes, I'm keeping on with the midwifery as well as I think I can still fit in a shift or two. Wow! what an adventure! Congratulations! Wow! How exciting for you. It looks like a great spot right there on the wharf where lots of people will come to look around. I wish you every success. This is such a great venture and I hope you get lots of local artists interested and wanting to participate. Sounds like life is going to bed very busy and exciting! Oh congratulations on your new venture!! How very exciting for you all and what a beautiful spot to have a studio/gallery, I think a trip up there from Auckland might be in the offing when you're up and running! OMG, another reason to visit the slightly mad lady down under!! I am so excited for you. How awesome!! Wowee Charlotte that is exciting news! What a fantastic idea. Wishing you a successful venture there. Exciting news, Charlotte. I wish you all the best in your new adventure. Holy cow, how did I miss this post. Congratulations! Lots of pictures please.